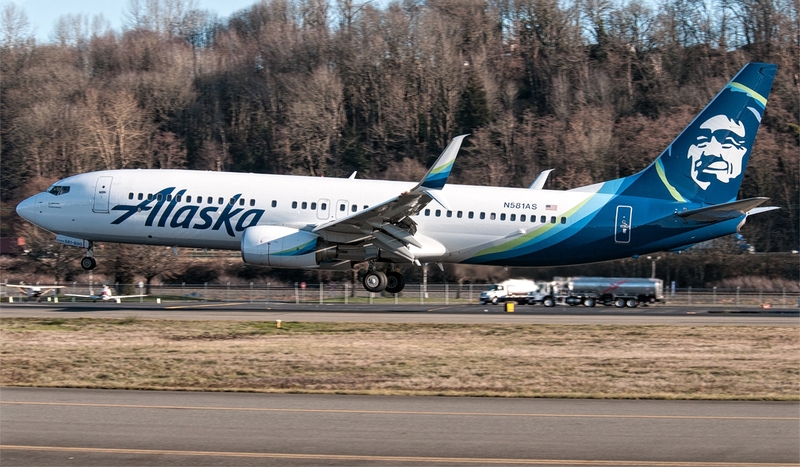 Alaska Replaces Boeing 737 MAX 8 to Larger MAX 9. Alaska Airlines has converted its orders for the Boeing 737 MAX 8 to the larger MAX 9, as part of a larger restructuring of its 737 order book. The Seattle-based operator converted its 15,737 MAX 8 orders to the largest variant, bringing its firm commitments for MAX 9 to 32 units, during the first quarter, a financial presentation. It also has 11 orders 737-900ER. Alaska will take its first Max in 2019 with deliveries that will continue through 2023. The 737-9 with capacity for 193 passengers in a two-class configuration versus 178 passengers on the 737-8, shows the Boeing website. Both models have the same 3.550nm range. Alaska Airlines has converted its orders for the Boeing 737 Max 8 to the larger Max 9, as part of a larger restructuring of its 737 order book. The Seattle-based operator converted its 15,737-8 orders to the largest variant, bringing its firm commitments for Max 9 to 32, during the first quarter, a financial presentation. It also has 11 orders 737-900ER. Alaska has also deferred a number of aircraft deliveries, extending them over the next three years, Chief Financial Officer Brandon Pedersen said in April. It has cut 2019 deliveries in half to 12 aircraft, one Airbus A321neo, seven 737 and four Embraer 175, out of the 24 that were scheduled for the end of 2017. The airline has balanced its aircraft capital commitments until 2022 with the postponements. The commitments range from USD 500-600 million annually from 2019 to 2021, and then decrease to USD 303 million in 2022, according to the presentation. Before the postponement, the commitments of the aircraft reached a maximum of USD 816 million in 2019, then fell steadily to USD 377 million in 2020, USD268 million in 2021 and USD 193 million in 2022. Alaska refuses to comment more on the postponements of the aircraft. The carrier plans to increase capacity by approximately 4% in 2019 and 2020, after an expected 6.5% increase this year. Alaska deliveries in 2018 remain unchanged. Expect two more A321neos, seven 737-900ER and 22 E175 until the end of the year, after taking an A321neo, two 737-900ER and three E175 in the first quarter. The Alaska subsidiary Horizon Air and the regional subsidiary SkyWest Airlines operates the E175. Cash, cash equivalents and marketable securities in Alaska decreased 5.6% to USD1.62 billion during the first quarter. Cash fell 10.5% year-over-year. Liquidity remained at USD1,930 million at the end of March, according to the presentation. The airline had USD 400 million available under its USD 475 million in lines of credit. Long-term debt, current net maturities, decreased by 8.8% to USD 2,060 million during the first quarter. The debt fell 18.6% compared to March 2017. Alaska invested USD 235 million in capital expenditures during the quarter that ended in March.